..Robert Hopkins (or “Hoppy as he was affectionately now as among the Blues faithful) falls well in to this category. Born Robert Arthur Hopkins on 25 October 1961 in Hall Green Birmingham Hoppy played for Blues 205 times and scored 33 goals in two spells between 1983 and 1991. He played under five different managers and three owners. While at Blues, he was relegated three times and also promoted. Hoppy has also recently been inducted into the Birmingham City Hall of Fame. He still lives locally in Solihull, is now a driver and writes for the Birmingham Mail. 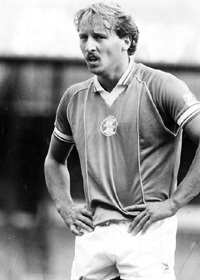 His career at Blues – 1983-1986 and 1989-1991 – saw him clock up 205 appearances and score 33 goals.